Prop Domain Auctions will be featuring one of their biggest auctions of the year with over 430 lots of screen used props from a wide range of movie categories including feature items from Superman, Batman, X-Men, Hellboy, Spiderman, and Chucky. This is Prop Domain’s 47th auction and an exciting day of live bidding is ready to go on Saturday August 6th, 2016. A piece of movie history that can not be found anywhere else is once again showing in this auction. This is the screen used and matched hero clock from the opening credits of The Adams Family. This animatronic clock is not only seen in in the opening credits but also throughout the film. This is a centerpiece of any display of movie and horror props and is available only at this auction. The value of this piece could exceed 20,000 dollars as it is a complete one of a kind collectible in very good condition. Prop Domain is auctioning off their last chest glyph from Batman vs Superman: Dawn of Justice. This is the best one they have brought to auction and the previous ones all sold for great prices. This is a warrior chest glyph which is complete with border on a cloth backing. This is estimated in value of over $1000 and is a great addition for collectors of these costume pieces. There is a huge special selection of issues from “Famous Monsers of Filmland” available in the auction. David has presented at auction issues from the original run which began print back in 1958. Most of the issues are in good to fine condition and they have sold very well in past auctions. These issues are a great buy and a must have for collectors of magazines and vintage monster memorabilia. A real piece of history is here and bidder should take as many as they can to build their own collection. In addition, there are pieces from a wide range of movies. Bidders should note that lot numbers are subject to change as items are added. The catalog is generally sorted into alphabetical order for easy browsing the day before the auction. 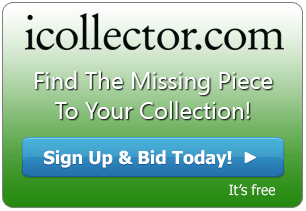 The auction starts at 10AM Pacific Time on Saturday August 6th, 2016 with full bidding available on iCollector.com.